The benefits of a healthy heart are worth the efforts that it takes. There are a number of ways for you to do this. 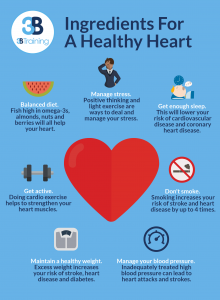 Take a look at the ingredients for a healthy heart below. Eating almonds, nuts, fish that is high in omega-3s and berries such as cranberries, strawberries and blueberries will all help your heart. Being stressed can affect factors that increase the risk of heart disease. Some may handle stress by drinking too much or smoking cigarettes, but these behaviours can increase your blood pressure. Try positive thinking and light exercise as a way to manage your stress. By getting enough good quality sleep, you will lower your risk of cardiovascular disease and coronary heart disease too. If you smoke, quitting is one of the best things you can do for the health of your heart. If not, you are increasing your risk of cardiovascular disease. These include coronary heart disease and stroke. Inadequately treated high blood pressure is likely to lead to heart attacks and strokes. Having excess weight will increase your risk of stroke, heart disease and diabetes. Getting involved with cardio exercise will help to strengthen your heart muscles and blood vessels, as well as lower your blood pressure and cholesterol. It will also improve the flow of oxygen throughout your body and reduce the risk of diabetes and heart disease.